We started watching BOLT over the weekend but the DVD skipped. J. had taken the girls to see it, but I still haven't seen it! I LOVE that invite, though. So super cute. Eeek! that is super cute! Perfect picture for it. We haven't seen Bolt yet. That is an awesome invite! That's an awesome invitation! Great job!!! We still have no idea what we're going to do for our kiddo but we have a few more months to prepare. 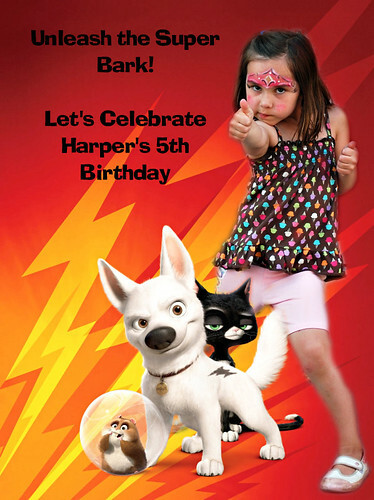 Hope Harper has an awesome birthday! I love it. Bolt is big over here at our place right now too. Hope you all have a great Birthday this year! WOW! That is awesome - you did an excellent job on that! And, wow, TONS of b-days in your family this month! Wow Jen. You did a fantastic job on that. I bet she loved it! You did an AMAZING job -- these are adorable! !